Amy Davis’s fascination with Baltimore’s historic movie theaters started with the one in her own neighborhood, the venerable Senator Theatre. Over the past nine years, the longtime Baltimore Sun photographer has used her free time and her 35mm camera to capture the city’s old theaters, from the sadly decrepit to the magnificently restored. The resulting book, Flickering Treasures: Rediscovering Baltimore's Forgotten Movie Theaters, comes complete with a foreword from the Baltimore-born director Barry Levinson and reminiscences from locals. It came out in September from Johns Hopkins University Press ($49.95), and would make a nice gift for anyone who loves movies, architecture, or the city of Baltimore. Below you'll find excerpts from our conversation with Davis and a few of her photos from Flickering Treasures. Top photo: The Hippodrome, built in 1914, was renovated and restored in the 2000s under the guidance of architect Hugh Hardy. It now serves as a popular performing arts venue. Above: The Patterson, dating to 1930, now houses a community arts center called the Creative Alliance. Why focus on Baltimore in particular? I really was interested in paying homage to my adopted city. I’ve been working full-time through the whole nine years of doing this book, and it wouldn’t have been feasible for me to travel hither and yon. I look at it as being like Dorothy in The Wizard of Oz—you can find what you need in your own backyard. 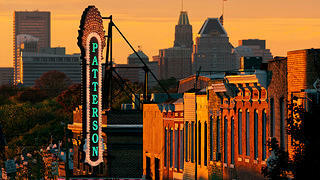 I live in the northern part of Baltimore, where the Senator Theatre is. I’m within walking distance of that 1939 Art Deco gem. I had become attached to that particular theater and its curved glass facade with colored neon tubes behind the glass. It looks so beautiful on rainy nights. But then I thought, what about everybody else’s neighborhood theaters? The book really started with that basic journalistic question. That’s when I began my hunt, and I was amazed at how many were left. 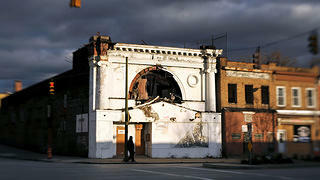 There are more than 100 theater structures still standing in Baltimore. Of the 72 theaters featured in this book, only 11 have been completely razed. That’s not bad, all things considered. 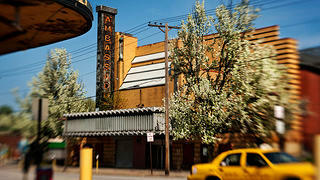 The Ambassador, a Streamline Moderne-style theater built in 1935, is one of Amy Davis's favorites. This photo was taken in 2010. The one on the back cover of the book, the Ambassador—one of Baltimore’s most beautiful Art Deco buildings. The theater has been threatened, but the city has named it a historic landmark. I think something good will happen there; I don’t think it will be torn down. It’s a 1935 building with that classic brick striping: blond brick and glazed, blackish-brown brick stripes. There’s one that’s very poignant for me, the Fulton. It was burned out several years ago and was torn down early in 2017, as the book was going to press. I had been looking at it for years and was very sad to see that one come to an end. The Fulton Theater was built in 1915 and originally named after silent-movie actress Gertrude McCoy. It was torn down in 2017, after a fire ten years earlier gutted the interior. How did you land so many interviews with local residents? I think the oral history component of this book is one of the most significant parts of it. I started reaching out to families of theater owners or people who had worked at theaters. And I branched out from there. There are a few notable Baltimoreans whom I reached out to [in addition to] Barry Levinson: John Waters, former mayor Tommy D’Alesandro III, actors Michael Tucker and Conrad Brooks. But most people in the book are just everyday Baltimoreans. You can’t forget about the people—that’s an important part of my book. 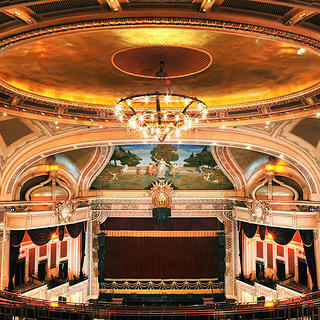 There are a lot of theater books out there, because they’re such stunning and marvelous and fanciful structures, but I don’t know of any book about theaters that has the presence of people in it like mine does. I hope it might spark a dialogue about the potential of these buildings, not just to celebrate the past but also to move on and do something creative with the buildings now. They’re not going to come back as theaters, we know that—with very few exceptions. When I look at them I see these layers of memory, and yet now they have a different life. Meghan Drueding is the managing editor of Preservation magazine. She has a weakness for Midcentury Modernism, walkable cities, and coffee table books about architecture and design.